Delicatus opened its doors less than two months ago. Owned and operated by former Oceanaire employees its a nice addition to the Pioneer Square area. Their main focus is lunch and the bulk of the menu is dedicated to sandwiches – lots and lots of great sounding sandwiches – with a few salads and soup thrown in for good measure. They also have a full bar. 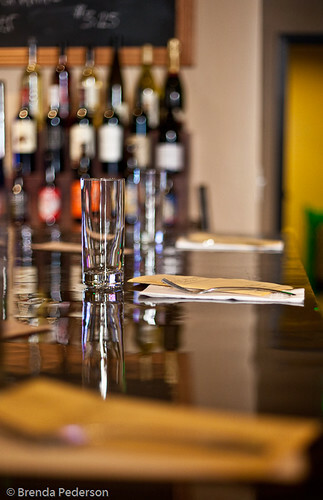 They are testing the evening business and traffic and to that end have added a few daily appetizer specials that are available from late afternoon into the evening. Last week M and I stopped in to check out this service. They have a decent number of wines available by the glass, there is a nightly beer special, and cocktails are also available. The list of appetizers is short, but don’t let that fool you. What they offer is very good. We started with the House Confit Duck, a perfect leg and thigh section that was tender and rich with flavor. 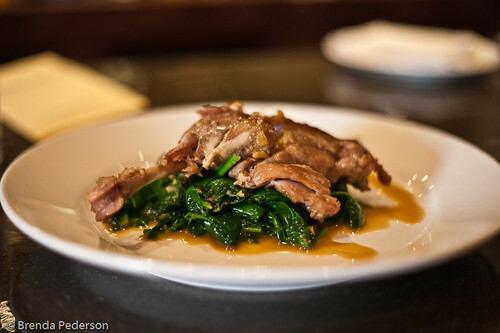 The duck was enhanced by a bed of sauteed spinach that was served with it. Absolutely delicious. 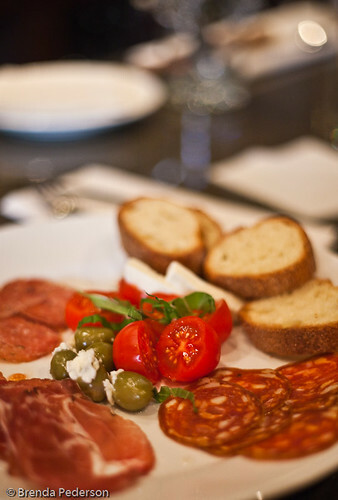 We followed that with a small charcuterie platter filled with interesting meats and some very nice additional items like blue cheese stuffed olives and sweet cherry tomatoes topped with ribbons of fresh basil. The space is cozy, the people nice and the food great. The only thing that was sometimes a little off was timing. I’m hoping that as they get more settled in those issues will be cleared up. When I arrived I was the first person at the bar and after asking for a wine menu, which was promptly delivered, it took some time for my server to come back and actually take my order. It seemed he was busy with something in the kitchen or at the sandwich counter and I started to feel forgotten, although once he returned my order was promptly filled. The confit seemed to take a very long time to be served and looking back we realized that it takes time to bring it slowly and carefully back up to temperature so it retains all the great character that’s been built into it during the confit process. But when we ordered it would have been great if we were told that it would be an extended wait or they could even add a note on the specials board. 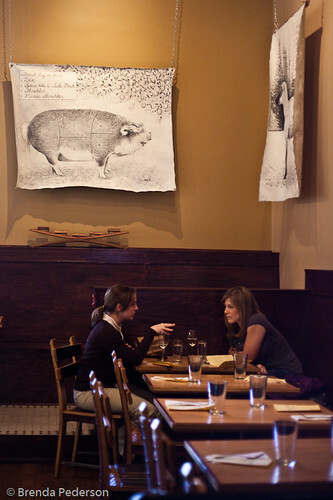 In fact, communicating this information would give them a chance to emphasize their local sourcing and hand-crafted foods. Most people ordering duck confit at a sandwich shop wouldn’t really expect it to be carefully created on site, even if it is called "House" confit. So taking the opportunity to notify the customer of the time needed to properly prepare it could both set appropriate expectations and also provide a little self-promotion. The timing on everything else was fine. We didn’t try the sandwiches but after reviewing the menu there are several I’d really like to try. It looks like I’ll be making a trip downtown for lunch sometime soon!